Love your smile without missing a beat. Take one minute to learn more about all-porcelain bridges. A dental bridge is used to replace a single tooth or multiple teeth to improve your smile’s beauty and function. It’s composed of two or more dental crowns and an artificial tooth. Dr. Paul Silberman will place the crowns on the teeth that are adjacent to the gap left behind from the missing tooth. These crowns are used as the anchor to support the artificial tooth, which will function as the new tooth. See how bridges can improve your smile aesthetically and functionally by scrolling below. Don't be victim to the consequences of missing teeth. 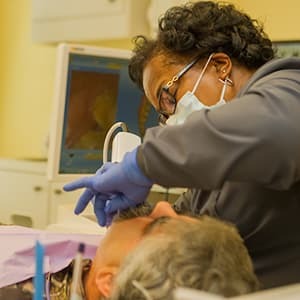 Alleviate stress on the bite: When you have missing teeth, the biting force changes, creating stress on the jaw joints (TMJ). A bridge fills that gap and brings harmony back to your bite and jaw joints. Enhance your smile’s appearance: Dr. Silberman is an artist when it comes to blending restorations with your smile. You can smile confidently without a missing tooth. Prevent teeth from shifting: Missing teeth cause your surrounding teeth to move out of place, making it difficult to clean your smile and putting your oral health at risk. A dental bridge stops your teeth from shifting out of place. Chew, eat, and speak normally: Do you have difficulty eating your favorite foods or are you slurring your words? Dental bridges are fixed and secure, allowing you to bite into that apple or speak without any hindrance. We believe gaining your trust is crucial for every dental treatment. You can trust we have excellent listening skills and will give you our utmost respect. If anything is holding you back from seeing a dentist, you can tell us. We will never judge you. All we care about is getting you to optimal health – not judge your past. You can trust us to always give you our honest opinion – no strings attached. We will explain all of your options and discuss the pros and cons of each one. The decision is up to you on which treatment to pursue. You can trust you will receive the highest level of care in the safest environment. We combine our experiences with modern technology to make dental bridges precise and comfortable. 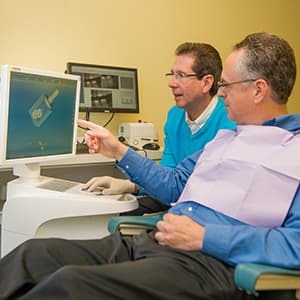 To save you time, we have the CEREC machine. This technology allows us to digitally create your crowns in just one appointment, allowing you to get your bridge faster. Trust your smile with a dentist in Waldorf, MD who is here for you. 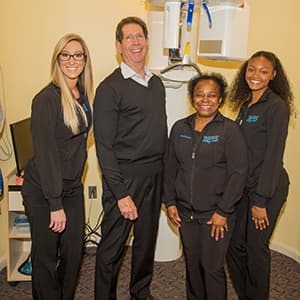 "I'VE FOUND MY FOREVER DENTIST"
HAVE QUESTIONS ABOUT DENTAL BRIDGES IN WALDORF, MD? Get answers to the most common questions below. Are there other options to replace missing teeth? Not sure what you need? We invite you to schedule a free consultation with Dr. Silberman. You can ask your questions and receive our honest recommendations – at no cost to you. We’re located in Waldorf and serve many surrounding communities in Maryland, including Charlotte Hall, White Plains, La Plata, Washington, DC, and Northern Virginia. Bridges can last a long time with the proper care and maintenance. As long as you keep up your oral hygiene routine and schedule regular checkups, your fixed bridge can last up to 15 years. Have any questions? Contact us today and let us help! What can I expect with my bridge appointment? Traditionally, creating a dental bridge usually takes two visits to complete. However, our CEREC machine allows us to craft your dental bridge in just one visit. First, Dr. Silberman will prep your teeth to make room for the crowns. During this time, he’ll be very gentle and compassionate to ensure the entire process is completely painless. Then, he’ll take digital impressions of your teeth, which is sent to our CEREC machine to mill your crowns and artificial tooth right in our office. Once the CEREC is done creating your restorations, Dr. Silberman will place the bridge. He will make any adjustments to make sure your bridge is cemented in place and your bite is balanced. Finally, you’ll walk out of our office with your gorgeous smile – free from missing teeth! Ask us about a free consultation and see if we're the right fit for you.